So, the other day, my partner bought himself two lanyards, so that he wouldn’t lose his work pass… Again. On the were little mobile phone holding loops, which he didn’t want. I took them off and was wearing one as a ring, which I thought looked rather cool, but it sparked the idea of using it as a finger loop on fingerless gloves. I’ve seen some lovely beaded ones, or ones with wire that are more jewelry than practical, and with winter coming up, and my crochet supplies out, this seemed the most logical. 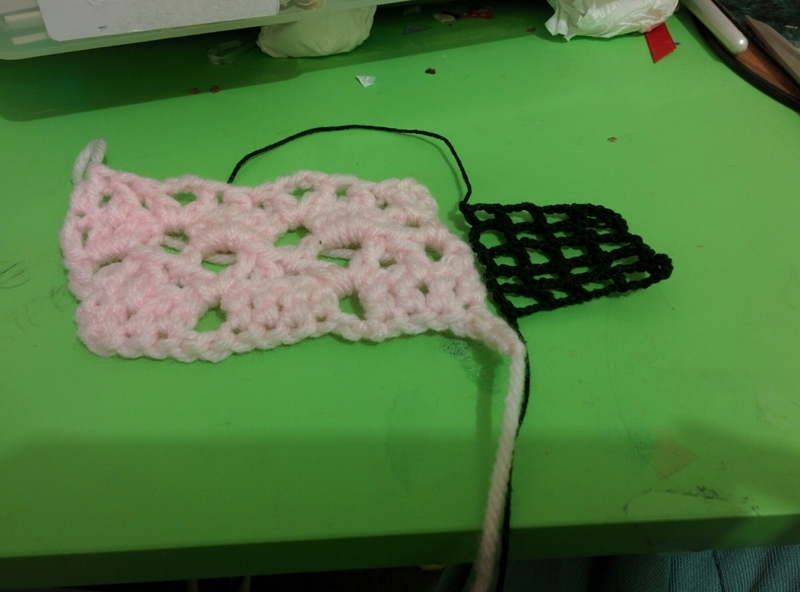 I am capable at crochet and can follow basic patterns, and Its easier to create shapes without a pattern than it is with knitting. The problem I have now is that I want to make the other side. It should be simple enough to see what I did, but I probably should have written it down, or counted chains as I went, but I was in the moment and forgot. In highschool, I wore a single arm warmer that I had made, leaving the other hand for a cool band bracelet. 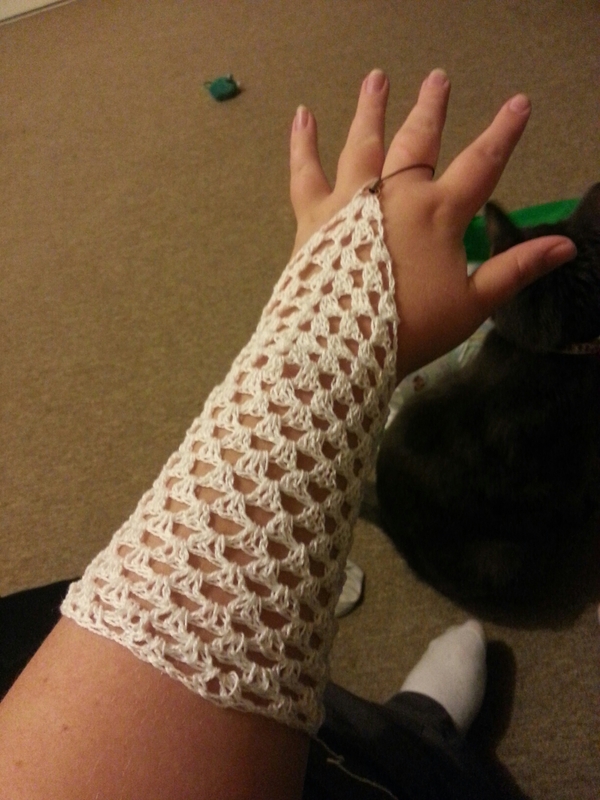 I don’t think that would work with this, as one of my wrists would get cold, so I had better make another one. I used crochet cotton for this, as any kind of yarn makes me itchy. It’s rather thick, but I’m not sure what number, as the label was lost years ago. I think I used a 3.5mm hook. I wanted it to work up quickly so I wouldn’t get bored and give up, and it gave it a nice lacy look, I think. This is technically from yesterday and today, bit I had a BBQ yesterday and went straight to bed when we got home. So made some progress on my amigurumi. It’s a little skinnier than the pattern I’m using from http://abbygurumi.tumblr.com but its still cute. 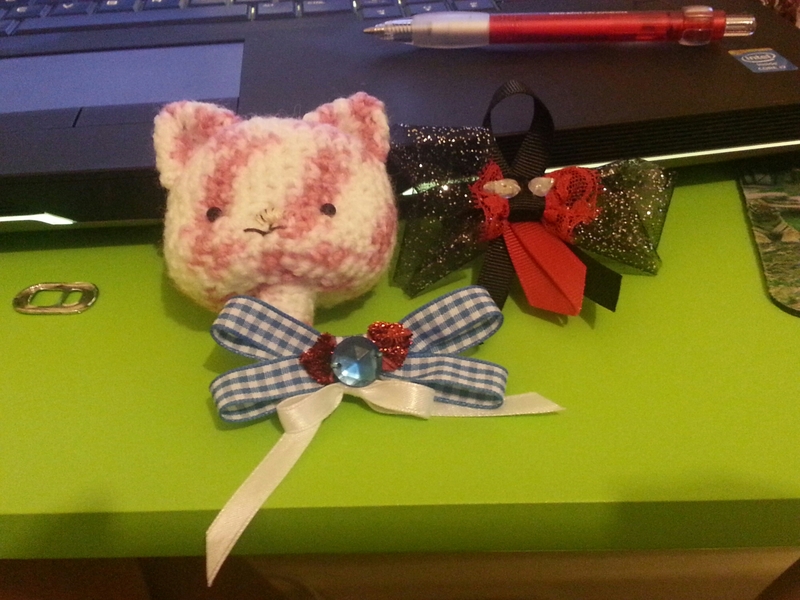 I had a massive case of insomnia the other night, and went crazy looking on pinterest for bow ideas. There was some awesome ones bases off of Disney princesses and ladybugs and all sorts. I tried a couple using what I had and using my own artistic licence. The black and white one is based on Venom from Spiderman. The original had a spiderweb pattern, but he only has them in the movies, not the comics, so I left that out. 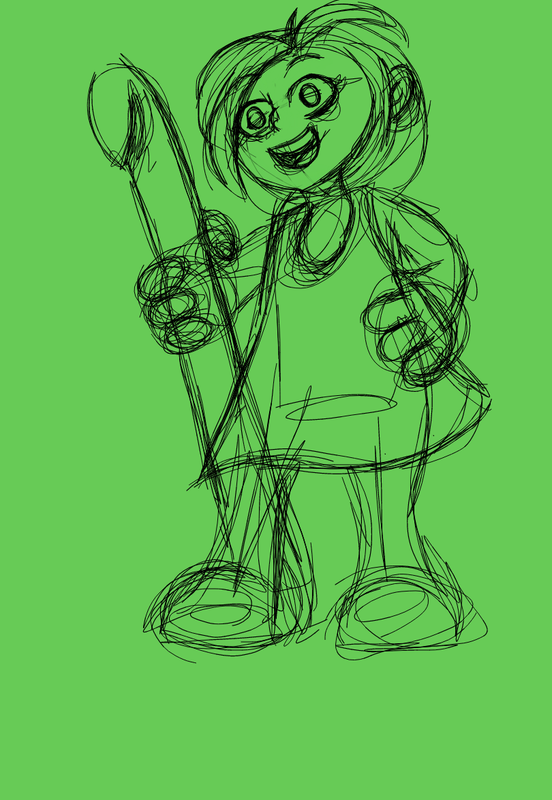 The gingham and ruby red is based off no other than Dorothy from the Wizard of Oz. The blue is slightly darker than intended but I think it still looks nice. I know I have the right ribbon somewhere, but my craft room is still a mess. I want to make some Dr Who scarves, which seems easy with the simple garter stitch, but I’m not one for big projects. Also considering how many of my friends are Dr Who fans, they all may want one. Its a ball! Its supposed to be a head, but at least I finally managed to make a nice round shape. Shows what happens when I follow a pattern! I found this awesomely cute wool (I’m a sucker for variegated wool) and needed to make something with it. 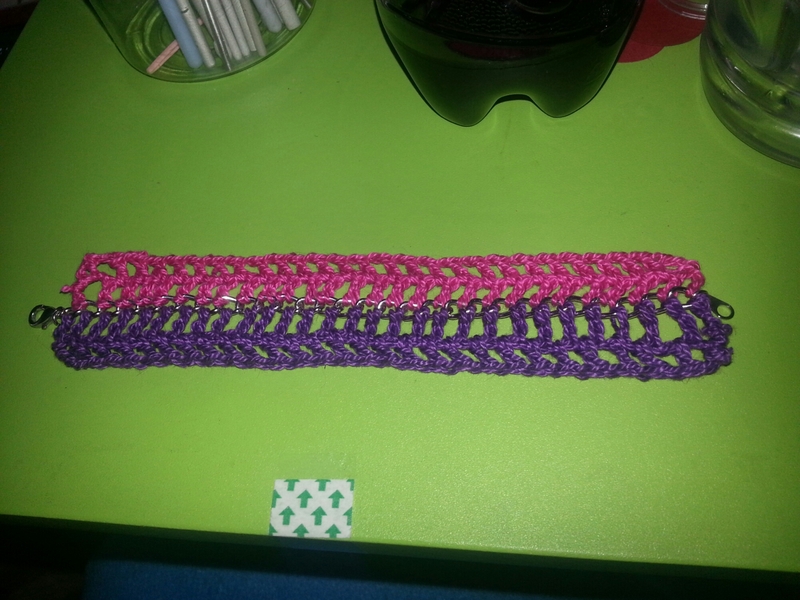 I started a scarf, but got bored quickly so its a bookmark or something…I put if on my cat as a saddle. She was not as amused as I was. At least it’ll be winter soon, so I can get out my blanket projects to work on :D.
Another cat toy with the same tools as yesterday! This one was based off a bookmark pattern my mum taught me. Usually they would have googly eyes, but not for the cat toy. I went to a craft market today which apparently happens regularly across the road from where we moved to- how awesome is that?! I thought I could base my stall on small items, or one of a kind. Maybe even the same things decorated completely different. A few of my friends also said they’d wear shirts with my art on it. So many possibilities, so little time. Well, enough time, managed poorly. First step would be to start on my craft room :D… tomorrow…maybe. 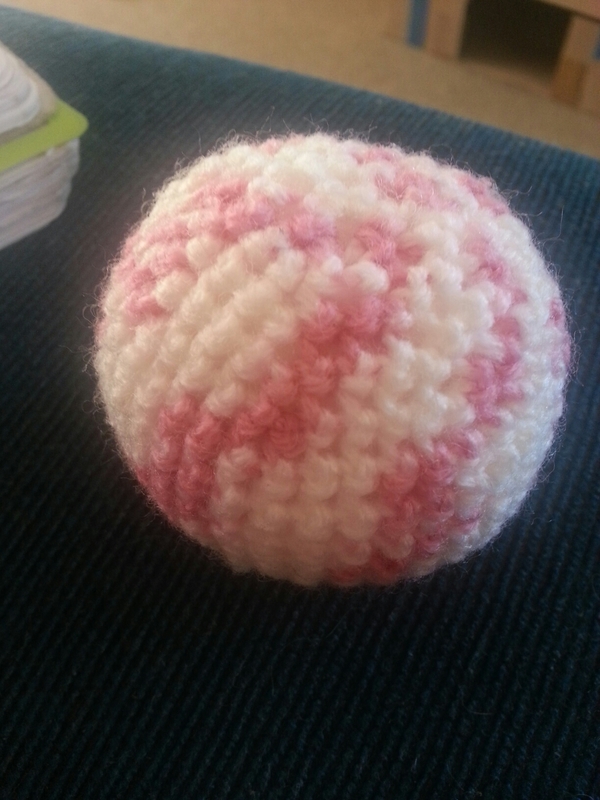 My cats really love a ball I made out of felt, so I wanted to make them another one. Everything is hectic from moving house, and I couldn’t get to my felt. I was going to make one out of fabric but it might fray too much. 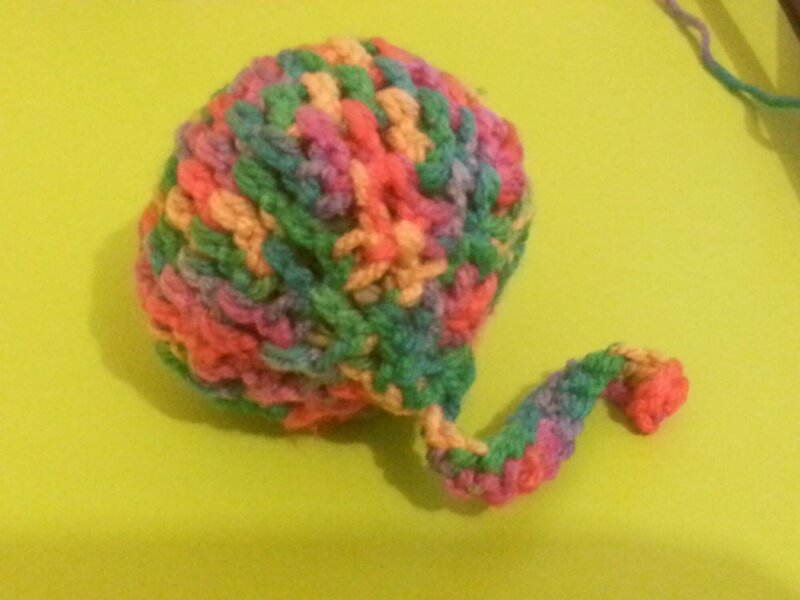 Then I decided to crochet something, since I had access to my wool. 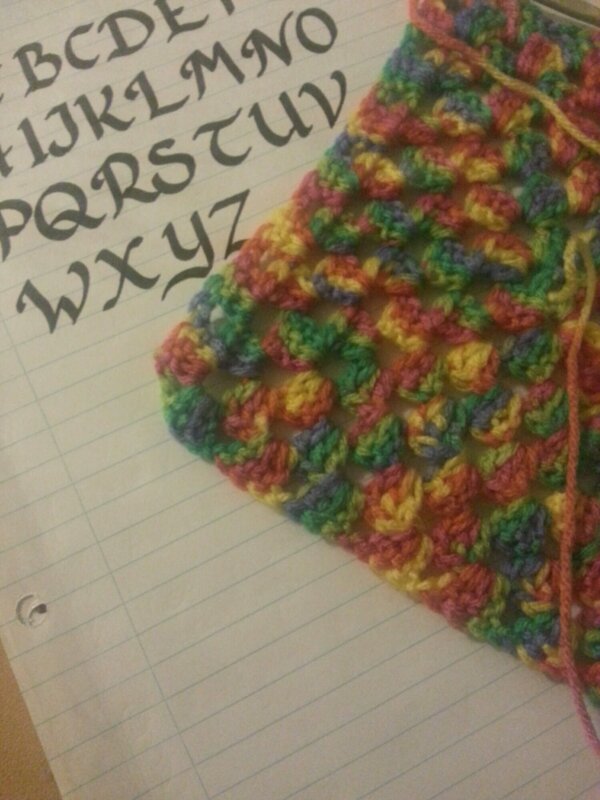 Then I couldn’t find my crochet hooks… I found one attached to a project and decided to use that. Next to find a pattern… nahhh. I knew how to increase and decrease on a very basic level, so I began forming a shape. The cats won’t know what a sphere is. I got near the end, a good time to stuff… if I knew where my stuffing was stashed. After a bit of consideration, I came up with cutting up sturdy plastic bags and stuffing it. 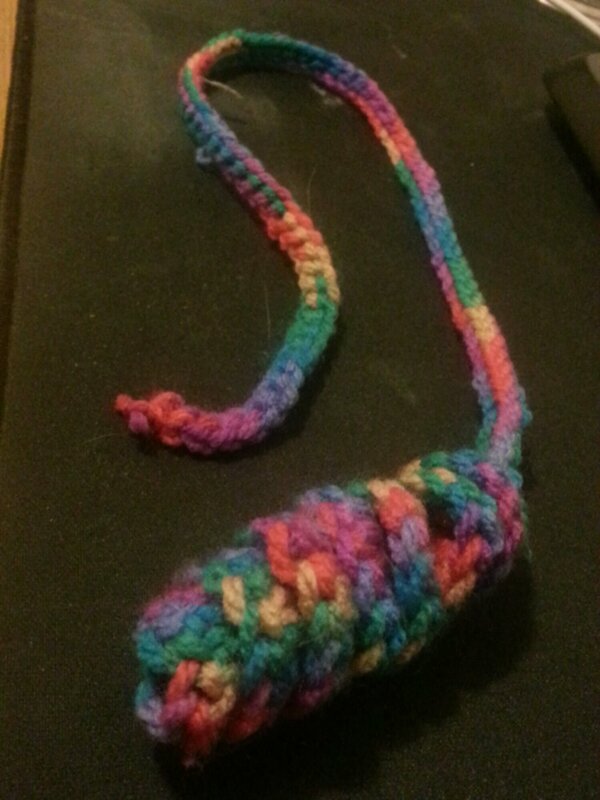 It makes a crinkly noise, so I crudely shut the end and added a tail for added funness.